Over Spring Break, a few members of The Polytechnic attended the College Media Association Spring National College Media Convention. 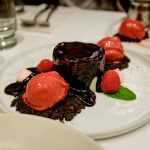 While we were in New York City, we visited Spot Dessert Bar on St. Mark’s Place. 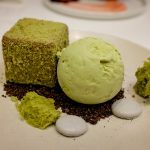 On the way there, Composing Editor Ana Wishnoff explained that this restaurant specializes in “Instagram-worthy” desserts. The line was out the door, and the four of us waited twenty minutes just to be seated at a two-person table. 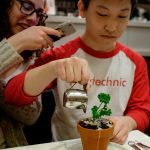 We ordered the Love Fondue, the Chocolate Forest, and The Harvest—the most “extra” dish, which included berries and Oreo crumbs arranged in a pot to look like a plant, along with a small pitcher of black rose milk tea meant to“water” it. While the dishes were diverse and pricey, we all agree that Spot is a place worth trying at least once.